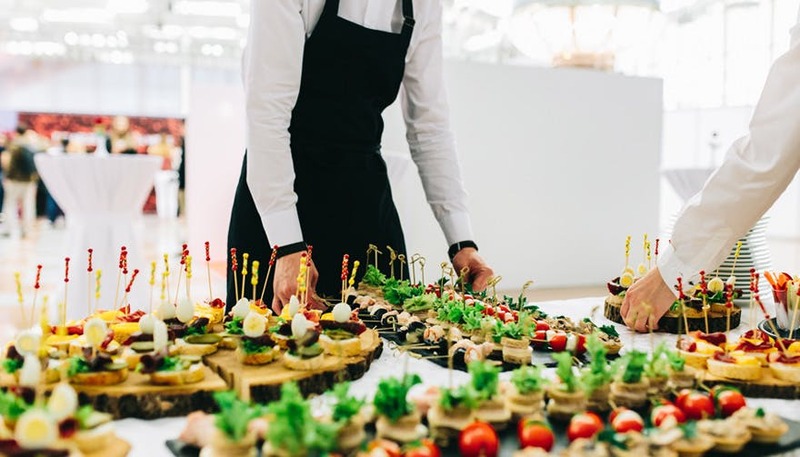 Catering is an important part of your wedding day, whether that’s the wedding breakfast and wedding reception meal or snacks, favours, and drinks. While there are abundant options for both formal and casual wedding catering, many modern couples are on the hunt for interesting and unique wedding food alternatives instead of the more traditional choices. So, here are some unusual wedding catering ideas that will make a wedding feast or wedding breakfast that’s memorable for all the right reasons—we guarantee you’ll say “I want that” at least once! Unusual feasts are more interesting than the run-of-the-mill chicken in white wine sauce, whether that’s an authentic Tudor banquet or an organic vegan meal. Check out these main meal and snack ideas, from custom pizzas to unicorn noodles. 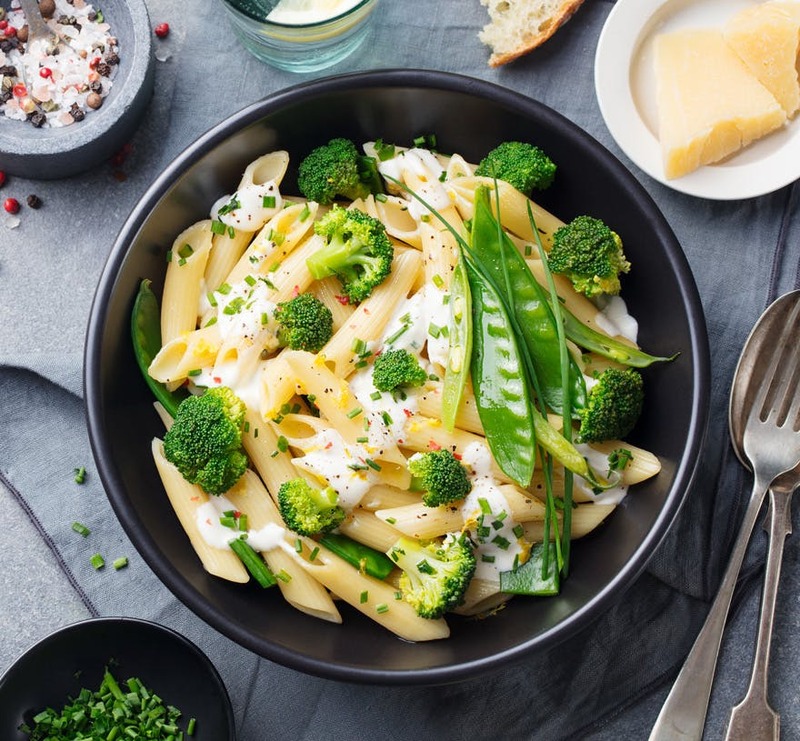 Bowl food is the hot new trend amongst the foodie community, owing to the fact that the recent royal wedding between Prince Harry and Meghan Markle featured “bowl food” as part of the lunchtime reception. The BBC defines bowl food as “larger than a canapé and around a quarter of the size of a main course. It is served in miniature or hand-sized bowls and comes ready to eat with a small fork.” They also explain that, with bowl food, guests can continue to mingle as they eat. We think this is a really neat wedding catering idea, however this bowl food “trend” is being met with derision by some—after all, isn’t all food that goes into a bowl basically “bowl food”? Featured above: Jess and Jonny’s DIY Backyard Wedding by First Mate Photo Co.
Pizza is loved by many, many people, so while BBQs and open roasts are pretty common nowadays for a casual wedding reception, we love the idea of a mobile pizza van. Not only does it offer an interesting topic of conversation, but throughout the evening you also get custom pizzas for you and your guests. 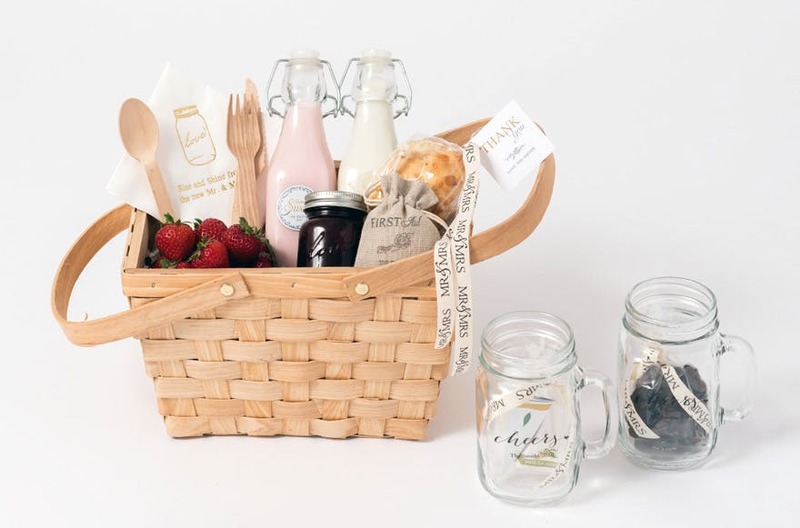 You could literally leave your mark on your wedding day with a personalised brand. If you choose to do this during your reception as an extra piece of entertainment then it goes without saying that extra special care must be taken! Keep these away from children and anyone who is/will be consuming alcohol. A barbecue in the height of summer will always be a great hit with your guests, and you can make it more interesting by providing a range of delicious salads, specialty breads, and marinated fish as well as the usual barbecue fare. Fancy chutneys and home-made sauces alongside oven-baked jackets and spiced potato wedges will make it a barbecue fit for a wedding and not the usual Sunday afternoon of well-done chicken wings, bangers, and buns. An attractive choice of sweet treats for dessert will finish off your wedding barbeque in style. Picnics are a great summer idea if your venue has the grounds, though here in the UK it may be prudent to have a ‘plan b’ in case of rain. Think large sun umbrellas, colourful picnic blankets or bales of hay covered in soft blankets. A pretty array of picnic foods on tables adorned with gingham and lace tablecloths, all decorated with fresh flowers and fancy cupcakes on vintage cupcake stands, would make this a picture perfect wedding breakfast. Mini food pieces are great as appetisers/finger food either all throughout the wedding reception (perhaps in addition to a buffet?) or in the space between the ceremony ending and the reception beginning. Mini fish and chips, anyone? In recent years algae has been quite a health food trend for all the nutrients that can be found in it, but having algae as part of your wedding menu isn’t as weird as it sounds at first. 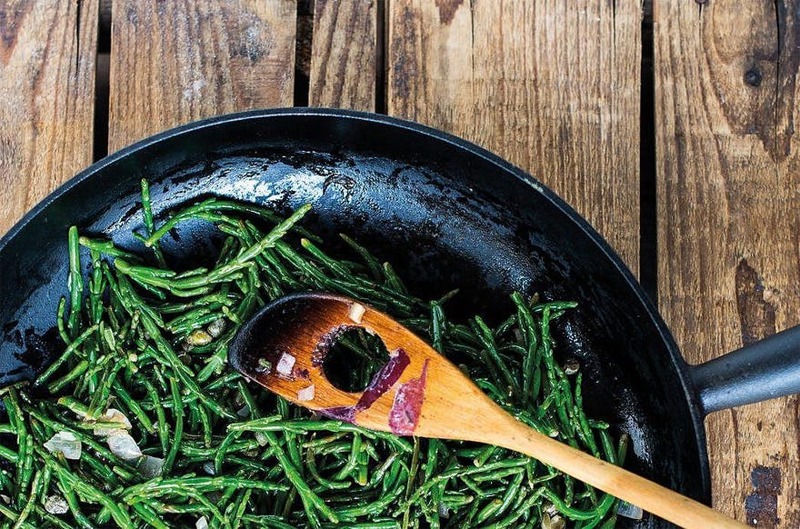 After all, seaweed is a type of algae and that goes well with all kinds of wedding menus from soups and salads to pies and bakes. 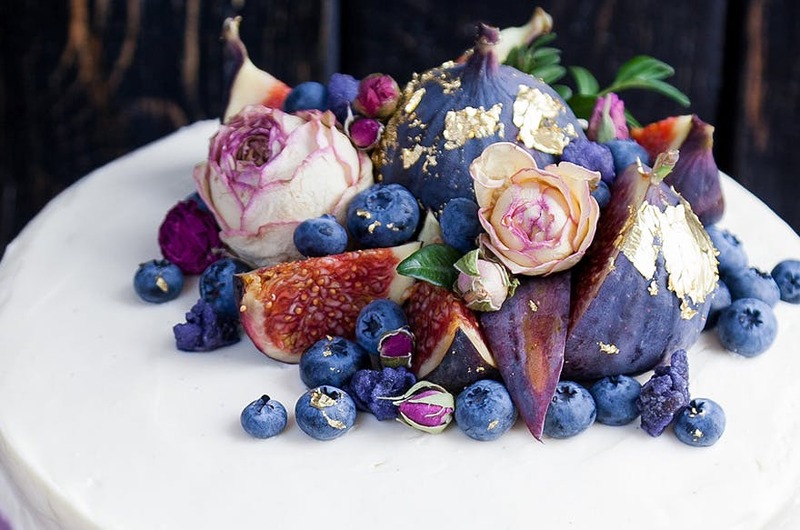 If you have the funds and the inclination, maybe you fancy shelling out on some edible gold leaf? 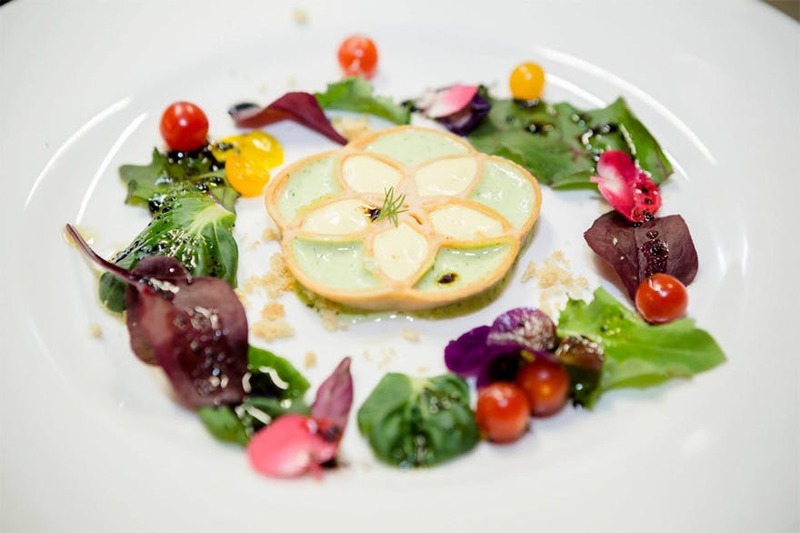 3D printing is a marvel—but did you ever think about 3D food printing? Designing your meal on a computer and then having it printed before your eyes? As unbelievable as it sounds, it is a thing. It’s growing more and more common to find beautiful flowers decorating your food and drink, and you’re encouraged to eat them because they are perfectly edible for humans (e.g. pansies, rose petals, and daisies, etc). Just be careful however, as some flowers that look pretty and have been featured in blog posts across the net can be poisonous (i.e. narcissi). 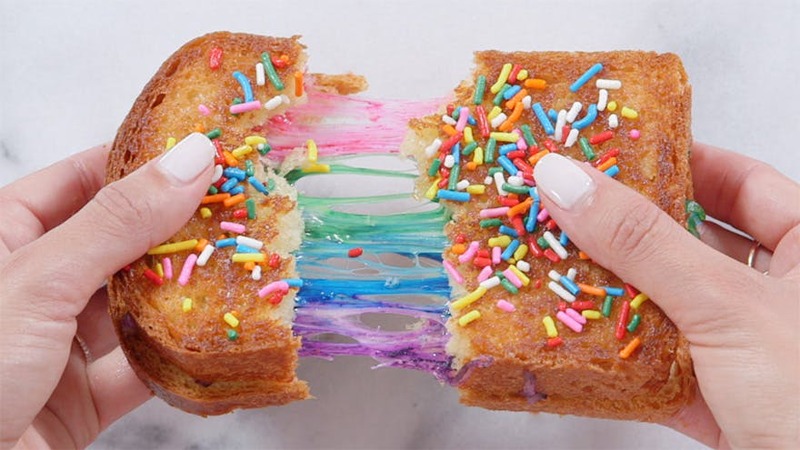 Add some wow factor to your wedding breakfast or wedding reception food with all the colours of the rainbow by way of rainbow grilled cheese, unicorn noodles, and rainbow toast. A lot of people love sushi, but you could step off the beaten track of “California rolls” or “nori rolls” and opt for something a little more unique like sushi bagels or doughnuts, sushi burritos, or sushi tacos. After your main wedding reception meal, you may want to treat your guests to one of these unusual wedding catering ideas that look just as tasty as they do impressive. 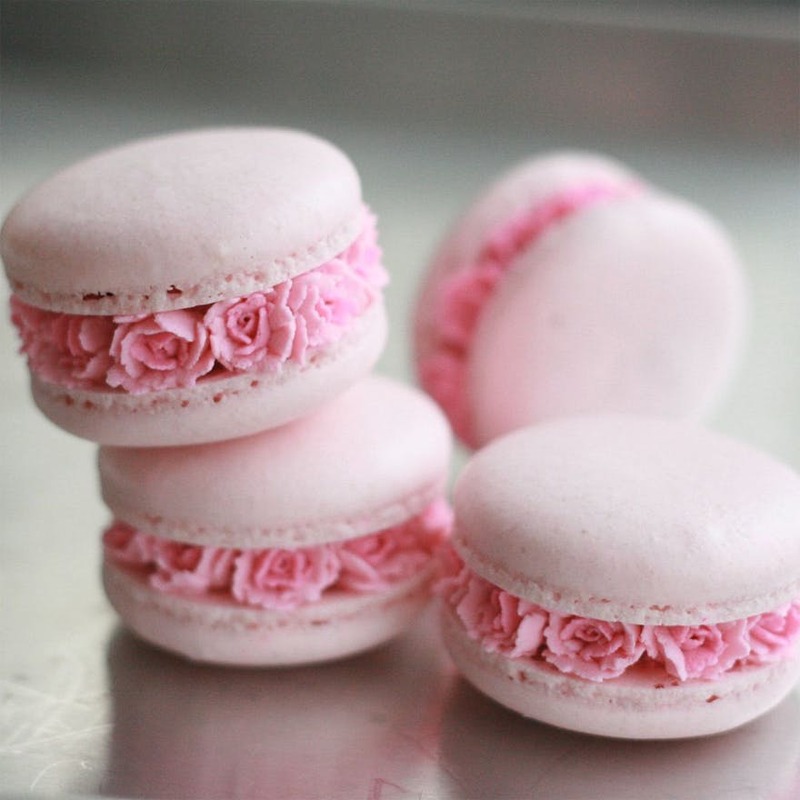 Classic macarons are beautiful already, but they look even better when filled with flowers. 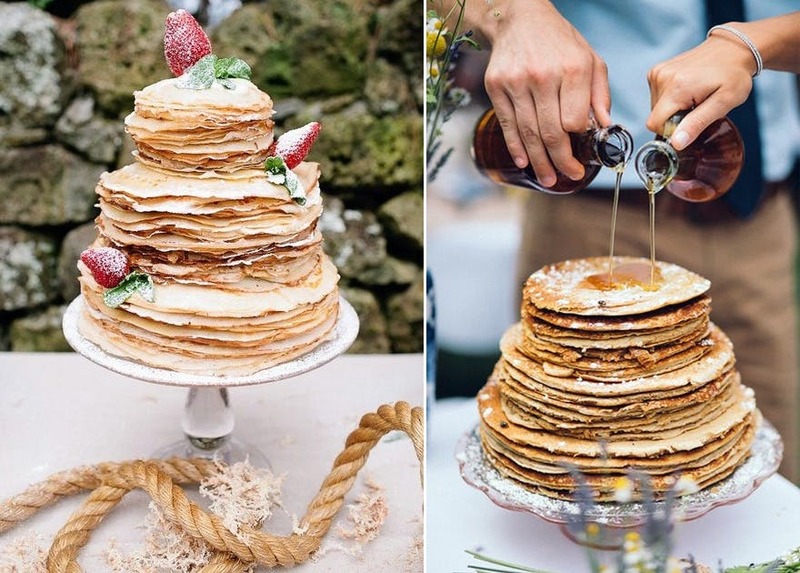 While cheese wedding cakes and other wedding dessert alternatives (like doughnut towers) are on the rise, did you ever consider a pancake or crêpe wedding cake? As well as being very pretty, it would also be very easy to dish out to your guests, especially for a smaller weddings—just give one layer to every person. 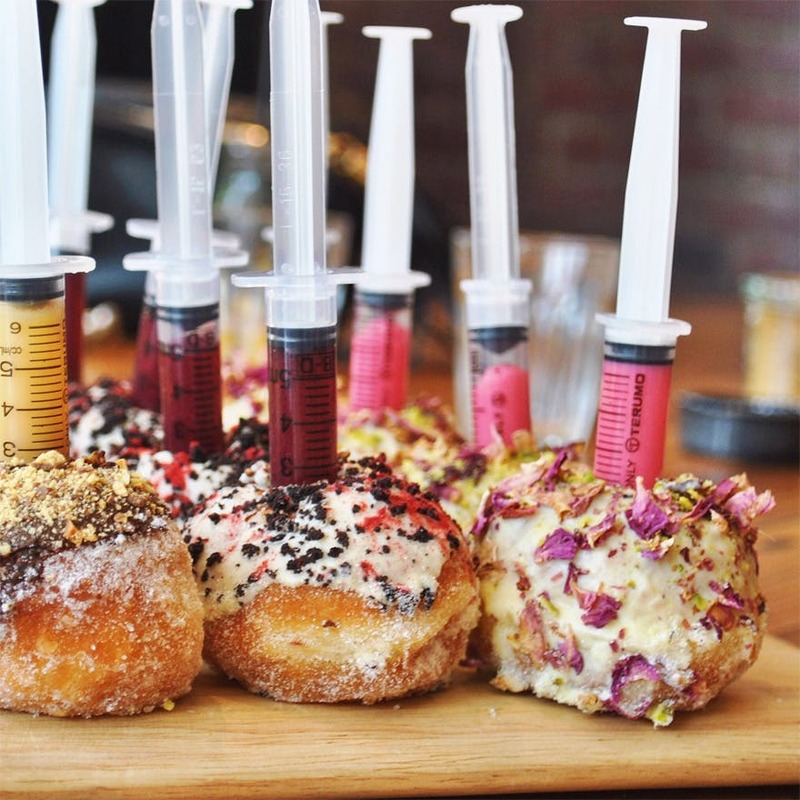 There are doughnuts, and then there are luxury doughnuts that let you inject your own choice of filling. 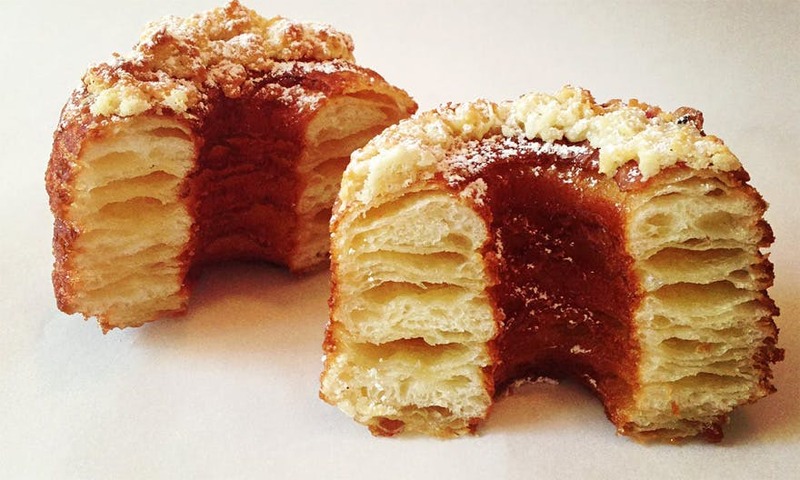 A cronut is a marriage between a doughnut and a croissant, and they look divine. 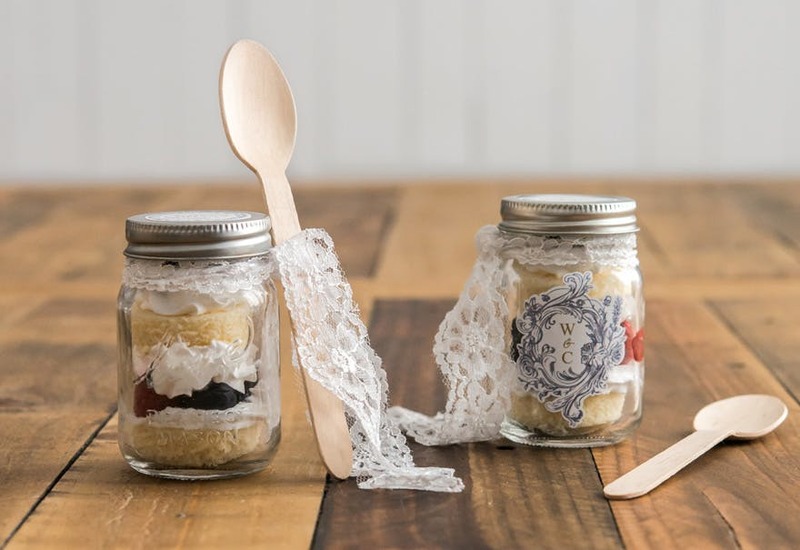 In a return of the mini foods, these miniature cakes in miniature jars are very sweet little desserts (or even wedding favours) that will add a lovely finishing touch to your menu. Alcohol can be very easily mixed with your wedding catering by way of alcoholic cupcakes. 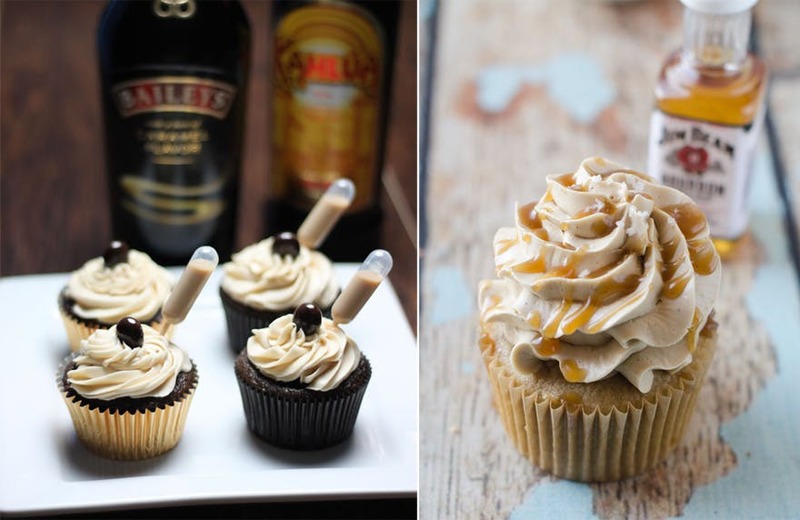 Not only are there very tasty looking Baileys and Salted Bourban Butterscotch cupcakes like those shown above, but there are also rum cakes and red wine cakes, vodka-drizzled sponges, and butterscotch fillings. In fact, you could add alcohol (responsibly!) 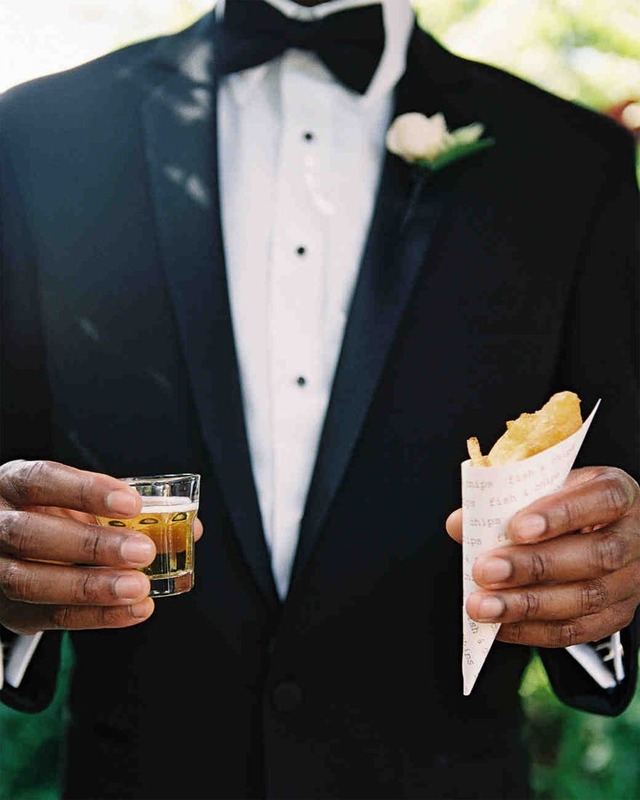 to other parts of your wedding catering too with wine milkshakes, whisky ice cream, and bourbon- or vodka-infused root beer floats. They’re sure to go down very well with your guests, and would also be perfect for hen and stag parties. Activated charcoal has become a trend in all manner of things from food to beauty products because of its alleged cleansing benefits. You can even find it in ice cream! 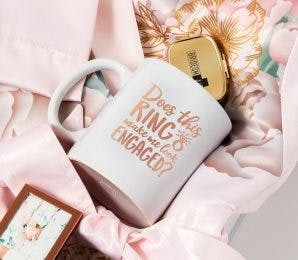 It’s a great point of interest, and a conversation starter, but if you choose to have this at your wedding just be aware that the charcoal powder can turn your teeth black. Ice cream is a must for any hot summer wedding, and what better way is there to add a pretty and unique twist to your ice cream cones than to create beautiful shapes like roses? Sticking with the ice cream, don’t these ice cream doughnuts look amazing? You might already be familiar with the geode wedding cake trend where cakes are created in the style of impressive crystals, but did you ever consider doing that in miniature with some colourful, stylish cake pops? There are so many ideas for interesting and unusual wedding catering ideas, and even a little imagination can take you a long way! Just exercise caution—as we found out in one of these wedding receptions from hell, it’s not always best to experiment with food on your wedding day. While it’s your big day, try and keep your guests and their tastes/preferences in mind too. And as great as some of these out-there, unusual wedding catering ideas are, you could also make an impact in just the smallest of additions to your menu. 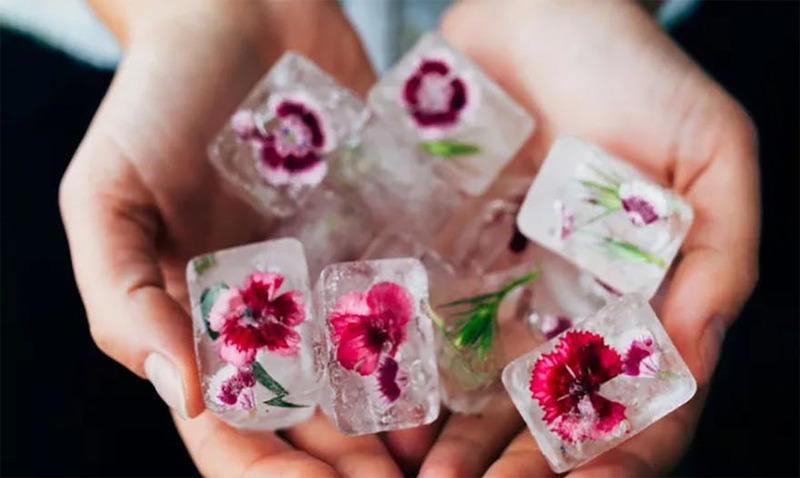 For example, add something more to your wedding drinks with some gorgeous flower ice cubes. When arranging your wedding catering, you may also have other specifications you’d like consider. For multi-cultural weddings a multi-cultural theme is not complete unless the food is authentic and you are true to your roots. An Indian wedding, and even a British-Indian wedding, would just not be right without some real Indian cuisine. If you’re marrying into a new culture then your wedding is the ideal event for your fiancé to show your friends and family the foods he/she grew up with and loves. If you’re vegetarian, vegan, or just a raw or organic food devotee then you could plan a very special wedding breakfast along those lines. You may even have your guests trying new foods they’ve never sampled before which in itself would make your wedding memorable for them. There are plenty of lentil and bean delicacies that, teamed with the right vegetables or exotic salads, would have your carnivorous guests buying veggie cookbooks on their way home. You could impress your guests with wonderful and unusual offerings and tempt the taste buds of those less adventurous. Some of the best wedding banquets are those that make the most of their surroundings—this can be the cherry on top of a perfect celebration, tying the entire wedding up in one theme. For example, fancy fish and chips in a seaside town, mini Cornish pasties in Cornwall, or fresh seafood by the sea. 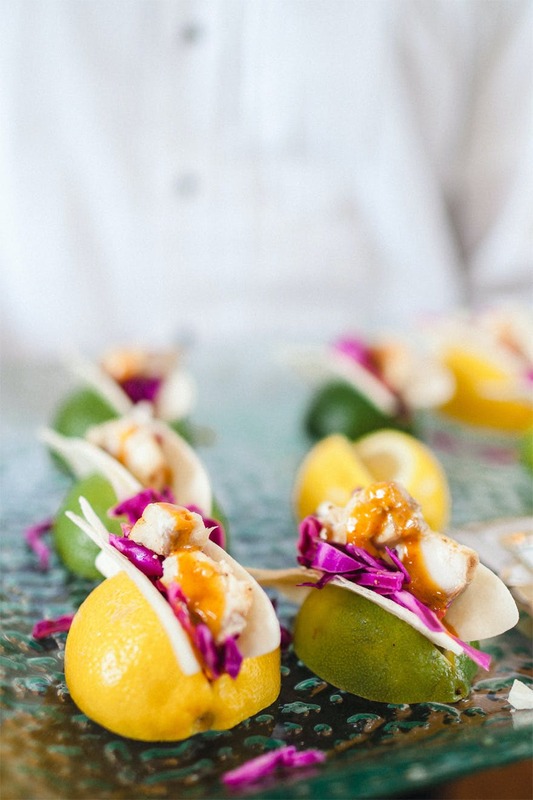 For more on wedding food ideas, check out our article on Vegan Wedding Reception Food!